We'd like to thank you for taking your time to refer us to someone you know. We value your business and appreciate your confidence. Please fill out our simple form to have one of our team memebers contact you. If you require immediate assistance or support please contact us via phone! 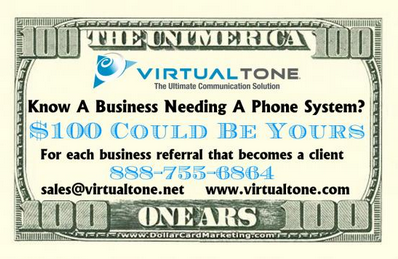 Anywhere you have Internet access, you have VirtualTone! At a significant cost savings over your current PBX system, VirtualTone's communication solutions present increased functionality and flexibility to present your enterprise with the highest degree of value possible. Through VirtualTone your organization's phone system isn't hosted on a cluttered server with thousands of other clients; it's hosted on a private switch dedicated strictly to your account. If necessary, we will provide you with an Internet-ready (SIP compatible) phone and then you are ready to use one of the finest VoIP solutions available today!